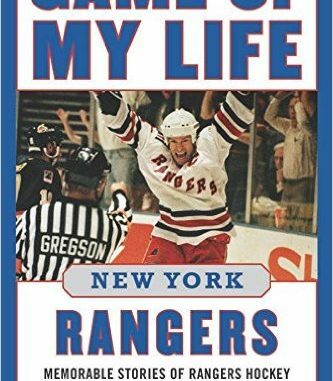 All of the famous tales about the New York Rangers (including Lester Patrick in goal; the 1940 Stanley Cup; Rod Gilbert’s first big game; Mark Messier’s “guaranteed” win; the 1994 Cup-winning heroics of Brian Leetch and Mike Richter, and Wayne Gretzky’s goodbye to the NHL) are referenced here. Stories from 24 New York hockey legends take fans inside the Rangers locker room and inside the heads of the players themselves. It is an anecdotal history of the biggest games in the history of the New York Rangers, one of the most popular teams to ever play on Broadway. John Halligan has spent the last 42 years as a communications executive, author, historian, and photo archivist with the New York Rangers and the National Hockey League. He has earned numerous professional and civic honors. Past titles include New York Rangers: Seventy-Five Years (Barnes and Noble, 2000) and The New York Rangers (Images of Sports) (Arcadia, 2003). John Halligan resides in Franklin Lakes, NJ. John Kreiser has covered the NHL for more than 30 years for The Associated Press, Sports Illustrated for Kids, and numerous magazines and websites. He has been in the Stanley Cup-winning locker room for all three New York-area teams and is currently a columnist for NHL.com. Past titles include The New York Rangers: Broadway’s Longest-Running Hit (Sports Publishing, 1996) and Eric Lindros (Ice Hockey Legends) (Chelsea House, 1997). John Kreiser resides in Floral Park, NY.